Walsall manager Dean Smith admits that at the start of this season few would have expected Burton Albion's short trip to Bescot to get star billing. But the sides meet for the first time at the Banks's Stadium on Saturday. 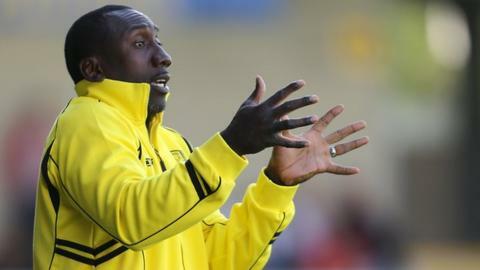 The League One leadership is at stake, with Smith's second-placed Saddlers three points behind Jimmy Floyd Hasselbaink's pacesetters. Smith told BBC WM: "Nobody would have predicted that would be a top of the table clash on international weekend." Separated only by a 23-mile journey down the A38, any previous meetings between the two clubs would have been relatively non-competitive affairs, in the Staffordshire Senior Cup. But this one is for real, Smith admitting: "We know that, if we win we go above them and that makes it even more exciting. Everybody knows it's the two top clubs at the moment in League One. "It's a real tough one though. We know that. Jimmy's done tremendously well to get them up there and carry on the momentum through from when they won promotion last season." Walsall's pre-Christmas home League One clash with Port Vale has been put back for live TV coverage to Sunday 20 December (12:00 GMT). Former Saddlers centre-half Smith is still hopeful that he can lead his home town club back to the Championship - but he is well aware that the more success he has with Walsall, the more likely he is to get offers to make it to a higher grade elsewhere, with other clubs. That was the case when Championship strugglers Rotherham United asked to speak to him this week. "There was an approach made," Smith told BBC WM. "But there's nothing I can say about it. It was turned down so I didn't even think about it. "If any club is doing well, then you come under the radar of other clubs very quickly, whether it be manager, staff or players. We're doing well at the moment so other people will take notice of that." Walsall manager Dean Smith was talking to BBC WM's Rob Gurney.